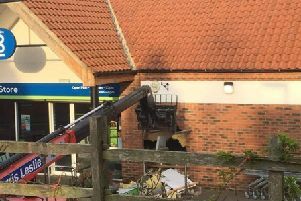 CCTV has been released of a man wanted in connection with a theft from Lincolnshire Co-Op in Market Rasen. Police believe the man shown in the photo can help with an investigation into the theft of meat valued at approximately £30. The man is described as being around 5 foot 10 inches, with short grey hair, which is receding, and was wearing a black jacket with red lining and light blue jeans. Five joints of gammon were stolen on Sunday, September 11, valued at £30. If you recognise yourself or recognise the person in the photo please call PCSO 2127 Neal Evans on 101, quoting incident 238 of the 11 September 16.